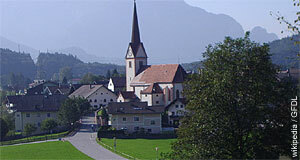 Adnet is a village in the Tennengau area of Salzburg and has a population of approximately 3,500. It is famous for its so-called marble, even though the stone is geologically not a marble at all, but very dense limestone. Adnet is lucky to rest of former coral reefs and other tropical marine ecosystems that were later petrified. Several reefs can still be seen today, as there are several quarries all over Adnet. However, most of them are not operated anymore. The Romans were probably the first who started to mine and use the Adnet marble commercially in the 2nd century. Later, the range of colours in which this stone could be found helped to make it popular among artists. Marble from Adnet was excessively used in Salzburg and beyond throughout the Middle Ages and modern times. If you make it to the Nawi, the science faculty in Salzburg, note the high wall of coral stone from Adnet in the cafeteria. Or the very common chess board patterns that you find on the floor of many palaces and burgher town houses in Salzburg and its surroundings: The light (pink or white) stone is from the Untersberg, the dark red one almost always from Adnet. The main pillars in the houses of Parliament′s central hall in Vienna are also made of Adnet marble. The main reason why the quarries are not used any longer are simple economic considerations: Importing stone from Asia or South America is cheaper. The village of Adnet itself does not have an awful lot to offer to international visitors. Due to its vicinity to Hallein, it does economically rather well; however, the over-all appearance of Adnet is characterised by agriculture. The name Adnet means "situated by a swamp", which might have been true in the 8th century when it was first mentioned, but does not apply any longer. The once Baroque parish church was destroyed in 1890 and rebuilt in questionable neo-Gothic style (or rather lack of style). Between 1909 and 1914, the Wiestalkraftwerk was built, one of the country′s first power plants. It led to Adnet′s early electrification and to the development of several small lakes which make the surroundings of Adnet highly attractive for easy hiking. A warning for fossil hunters: Due to Adnet′s relative fame for its marble, private collectors often visit old quarries without invitation. The owners, usually local farmers, are generally unwelcoming when it comes to uninvited digs.